The Center for Southeast Asian Prehistory (CESEAP) is an NonGovermentOrganistion working on the field of PalaeoAnthropology. It is found in July 1999 in Hanoi by a group of vietnamese anthropologists, who are working as professor, researchers in the scientific social sciences as archaeolology, ethnology, languistic, fine art, museology of Universites, research Institutes of Vietnam. 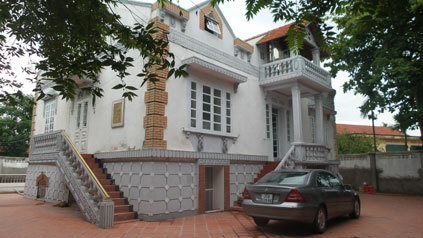 The main office of CESEAP is located in Hanoi, where works CESEAP Leadership and his administration. Until 2008 the CESEAP has four further research stations in Hanoi, Hung Yen, Quang Ninh and Hoa Binh. One of Hanoi is publishing redactation, of Hung Yen is focusing onto ancient metal metallurgy, of Quang Ninh is the display rooms of Pham Huy Thong Museum and its laboratories, and of Hoa Binh is research station for Hoabinhian excavations, for Ancient Muong tradition and heritages nad for test experiment of ancient living technologies. The CESEAP is working and existing through long term or short term systems of scientific projects, which are sponsored by vietnamese Government or by national and international foundations. The CESEAP is found himself the Pham Huy Thong foundation to honorate the first director of the Institute of Archaeology Viertnam ( 1916 - 1988 ). The CESEAP found and leads also : The Clubs "Friends of Vietnamese Ancient Fine Arts", "Friends of Vietnamese Prehistory" , "Friends of Pham Huy Thong Museum", "Friends of Ancient Muong Culture", "Friends of Ancient Hmong Culture", "Friends of Ancient Textile Traditions in Vietnam" with hundreds members. Since beginning (July 1999) Dr. Nguyen Viet is being the director of CESEAP. 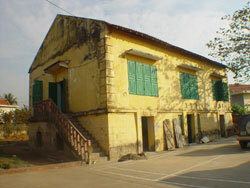 Pictures : PhamHuyThong Museum in Quang Yen town. Left, The 100 years old french building (photo in 2004) and Right, After Renovation in Dec. 2012.